On Tuesday morning, Buckeye Valley Middle School students recognized those who have taken the military oath and served their country. Pictured, left to right, are Earl Redmond, U.S. Coast Guard veteran, and Richard Doritty, U.S. Air Force veteran, saluting as taps were played by the Buckeye Valley Middle School trumpet ensemble at the end of the program. 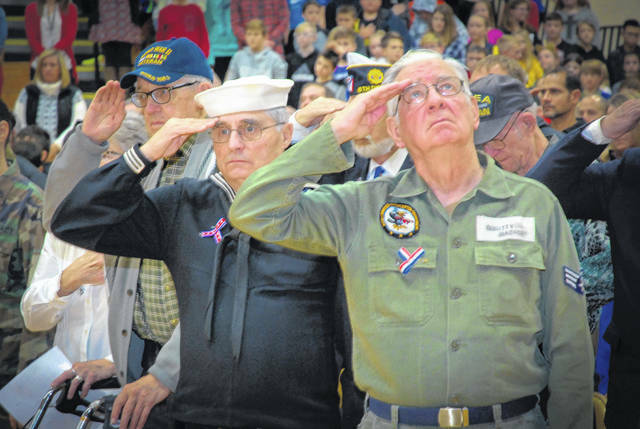 Buckeye Valley Middle School students Tuesday morning momentarily put aside the class lesson to warm the hearts of U.S. veterans by letting them know they are appreciated during the school’s annual Veterans Celebration. Tina Francis, the career-based instruction coordinator, has headed up the school’s celebration every November for the past 13 years. During the celebration, she told the students and veterans in attendance that many of her students have gone on to join the military. She pointed out a couple of students who are in the Army and now work on Humvees. Ostrander Mayor Larry Crile was one of those honored Tuesday. He said he served in Vietnam as a Green Beret, that he graduated in 1964 with the first Buckeye Valley High School class, and he played on the first Buckeye Valley High School football team. Crile said it was the first year that several of the local schools were combined to become Buckeye Valley High School. He said it was a struggle to get the football players to work together, but once they did, they beat Delaware Hayes in the school’s first-ever football game. Crile told the crowd a story about a moment when he served in the Army during the Vietnam War. He said it was his and six other soldiers’ job to protect a small village. “When good people come together, they can do great things,” he said again. Brooklyn Robinson, 10, attended the program with her grandfather, Frank Robinson, who served as an Army medic. She said “it’s cool” that he served in the Army, and she has thought about joining the military herself someday. Frank Robinson said he didn’t see any combat, because he was stationed in a hospital for burn victims. Richard Doritty, who served in the U.S. Air Force from 1960-1964, said he served as a radar operator. Earl Redmond, who served in the U.S. Coast Guard from 1958-1962, said he was 17 years old when he enlisted. He said he served as an electronics technician, and the equipment he used was all vacuum tubes at the time. This entry was tagged Buckeye Valley Local School District, Buckeye Valley Middle School, D. Anthony Botkin, Earl Reddmond, Larry Crile, Richard Doritty, Veterans. Bookmark the permalink.